Approximately 300 people took part in an „unauthorized“ spontaneous demonstration in Göttingen on Friday evening, called for in response to „Martin R.“ having to give his DNA sample to the police earlier the same day. In the course of the dynamic and powerful demonstration police were attacked on several occasions, and indeed successfully chased from the University campus. Hopefully this will serve as a clear notice, for the cops as well as for the newly elected left-wing university parliament, that cops will no longer be tolerated on the university! During the course of their retreat, police officers „lost“ several items of clothing/protection, aand a police cameraman took a rather unexpected outdoor winter bath. In and around the university, several attacks against police officers and vehicles took place, causing damage to one vehicle and causing a police transporter to undertake a somewhat panicked escape when suddenly approached by masked demonstrators with stones. 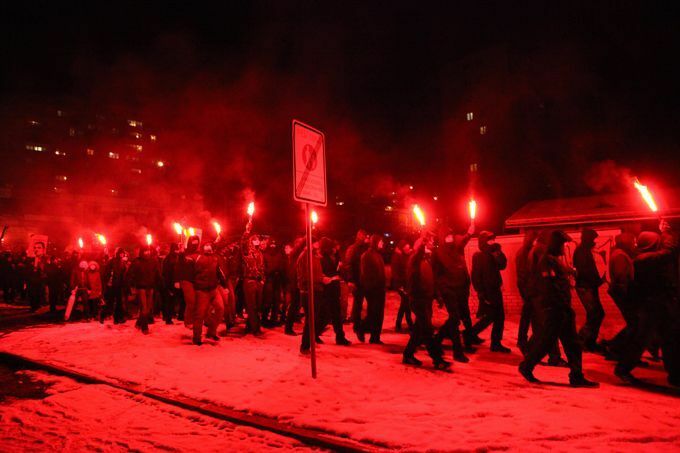 The entire course of the demonstration was marked by the building of small „barricades“ and use of fireworks. After almost two hours, the demonstration ended once again the center of Göttingen, with no arrests. After being wanted and searched for on a national level for several weeks, and in the face of having no realistic prospects of actually stopping the DNA measure, „Martin R.“ decided to at the very least set the time and conditions himself. After participating in the large solidarity demonstration on Saturday, he went accompanied by elected representatives of Die Grünen, SPD, and Die Linke to the police station this morning. Before entering, he read a short statement in which he thanked all of those who had expressed such a broad, and also practical, solidarity with him over the previous weeks. The demonstration and events of Friday evening, together with the broad and continous solidarity and mobilization, can only be considered a resounding victory for extra-parliamentary and autonomous politics in Göttingen. The message to friends and allies is that effective resistance to state repression and violence are not only possible, they are closer in reach than many believe. The message for the state and the cops should be equally clear: Hands Off of our friends, houses, and structures! From Athens to Göttingen, Göttingen to Athens: Their Repression, Our Solidarity! from Athens, we are sending you our comrade greetings and our solidarity with your struggle against the repression by the state of Germany. The attack of the state and capital against the western societies of the developed countries by means of intensifying exploitation and oppression, condemns millions of people into poverty and social exclusion, while the looting of the so called capitalist periphery continues with an unrelenting pace. Aiming at the prevention, within the western bloc, of social explosions which are born in these conditions, the state is constantly getting armed: social control is becoming suffocating (cameras, DNA data bases), the streets are filled with fully armed police forces, all new antiterrorist laws are being created and the state propaganda through the media is becoming more intense. 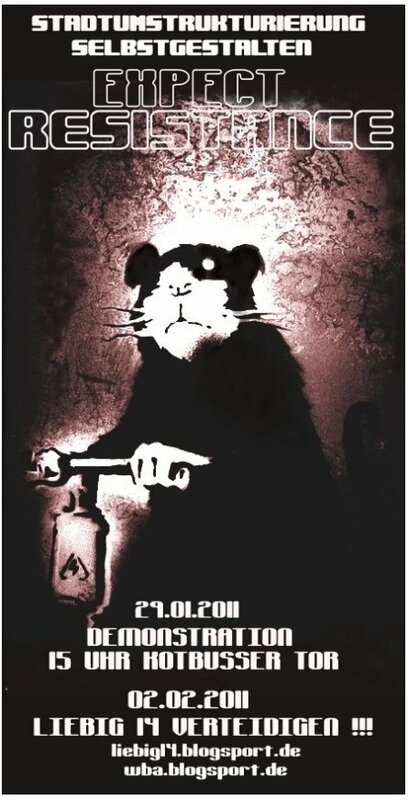 Targeted by the state repression are those people who resist state barbarism, especially anarchists and antiauthoritarians being the most dynamic and radical part among those who resist. Here in Greece, in Germany and all around the world hundred of strugglers are facing state violence, through frame-ups, prosecutions and imprisonments. We perceive the comrade’s refusal to give DNA sample to the German police as yet another act of resistance against the regime of terror, exploitation and submission which is forcibly imposed on us by the state and bosses. We stand with solidarity by our comrade’s side because every attack against one of those who struggle is an attack against each and every one of us. We fight for a new world of freedom, equality, solidarity and we are not going to stop until we win. No one in the struggle is alone against the state! GenossInnen, aus Athen senden wir Euch Grüße und erklären uns solidarisch mit Eurem Kampf gegen die Repression des deutschen Staates. Die Attacken von Staat und Kapital gegen die westliche Gemeinschaft entwickelter Staaten durch die Intensivierung der Ausbeutung und Unterdrückung, verbannt Millionen von Menschen in Armut und soziale Ausgrenzung. Gleichzeitig wird die Plünderung der so genannten kapitalistischen Peripherie mit unnachgiebiger Geschwindigkeit fortgeführt wird. Ausgerichtet auf die Verhinderung – innerhalb des westlichen Blocks – von sozialen Explosionen die unter diesen Umständen entstehen, rüstet der Staat konstant auf: soziale Kontrolle wird erdrückend (Kameras, DNA Datenbanken), die Straßen sind gefüllt mit hoch gerüsteten Polizeikräften, neue Antiterrorgesetze werden geschrieben und die öffentliche Propaganda durch alle Medien wird immer intensiver. Ziel der staatlichen Repression werden Menschen, die sich der staatlichen Barbarei widersetzen, vor allem Anarchisten und anti-autoritäre Menschen, da sie häufig der dynamischste und radikalste Teil des Widerstands sind. Hier in Griechenland, in Deutschland und überall auf der Welt sehen sich hunderte Kämpfende mit staatlicher Gewalt konfrontiert, durch Verleumdungen, Verurteilungen und Wegsperrung. Wir sehen die Weigerung des Genossen, seine DNA Probe der deutschen Polizei zu geben, als noch einen weiteren Akt des Widerstands an, gegen das Regime des Terrors, der Ausbeutung und gegen die Unterwerfung, die uns gewaltsam durch den Staat und die Bosse aufgezwungen wird. Wir stehen solidarisch an der Seite unseres Genossen, jede Attacke auf einen der Kämpfenden bedeutet eine Attacke gegen jeden und jede einzelne von uns. Wir kämpfen für eine neue Welt der Freiheit, Gleichheit und Solidarität und wir werden nicht stoppen bis wir gewonnen haben. Niemand im Kampf steht allein gegen den Staat. Comrade Martin R. had his DNA sample taken today by the police. Therefore, today is „Tag X“ and a spontaneous demonstration is called for at 18:00, Marktplatz, Göttingen. 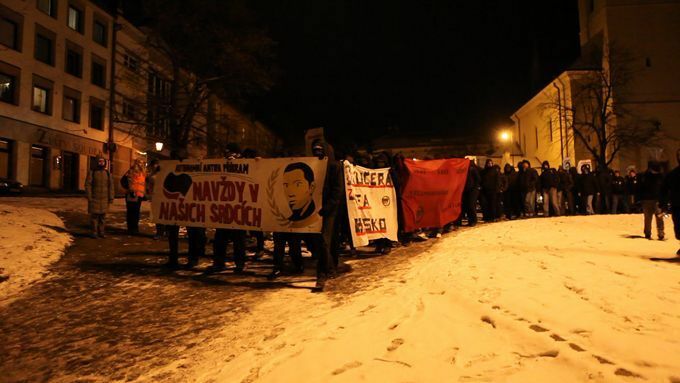 *On Saturday in the Czech Republic, antifascists remembered the third anniversary of the death of Jan Kucera, murdered by fascists in January of 2008. 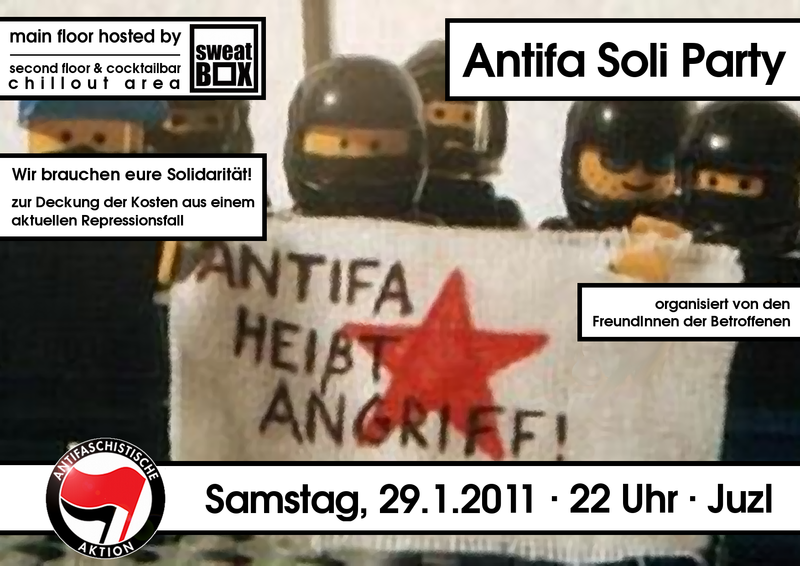 If you click here, you can read a full report from antifa.cz about the days events. Click on „English Translation“ under the article title for an English version. Vzpomínkový pochod k třetímu výročí úmrtí Jana Kučery from 161media on Vimeo. -First of all a reminder that the discount action on the new jackets ends on Monday night! After that, they return forever to their normal prices. And while we are on the subject…the feedback has so far been incredible, and we are frankly somewhat shocked at the large amount of jackets we have sent out over such a short period of time. Thanks very much! Furthermore, we added two new Mad Butcher Records releases to the catalog today. On the one hand, the debut album of Kapelle Vorwärts, a band composed of ex-Commandantes members and also performing punkrock versions of classic songs of struggle and resistance. The second release is the third full length of the Italian ska-combo The Offenders, titled „Shots, Screams, and Broken Dreams“. *Last but most certainly not least, after almost two months of terrible painful abstinence, Argentine futbol begins again tomorrow. Or at least third division does, and with it the dream of seeing the currently first-placed Atlanta finally make its return to second division this June! Its all very exciting, we know, but please try to control yourselves! Du browst gerade in den Fire and Flames Weblog-Archiven nach dem Monat Januar 2011.